What kind of cookie breaks easily into multiple pieces when dropped? I'm going to be running a science workshop for kids, where kids build a "ballistic reentry vehicle" out of a cardstock paper, holding cookies inside it. The kids will be dropping the vehicle from a height of about 6ft. The kids will be designing the box in such a way as to keep the cookies from breaking. I'm looking for a type of cookie that breaks easily when dropped from such a height. I'd prefer not to bake the cookies myself if I can avoid it. I just need to know what kind of cookies I can buy from a store that are most likely to break apart into multiple pieces when dropped. I imagine the cookies would have to be brittle, but I don't know what kinds of cookies tend to be the most brittle that would be readily/cheaply available in a store. I think most cookies are made to retain their shape rather well, but I'm sure some types are more breakable than others. I would prefer cookies that fracture and break apart into multiple pieces easily when dropped, not cookies that simply fracture or flake off the surface. What kind of cookie breaks easily into multiple pieces when dropped? If I had to bake the cookies myself, what would I have to do to ensure that they come out brittle and easily breakable? Without buying and testing all kinds of cookies to find the the right kind, what properties of the cookie should I look for (e.g. ingredients, style of cookie, etc...) that increase the likelyhood of it being easily breakable? See if you can find a cookie that is both thin and crisp -- the thinner the better. Minor damage will be more destructive on a thin cookie, while on a thicker one it would just cause some crumbing. A pizzele can also be pretty breakable, but when I've seen them in commercial packaging they are a softer version. A fortune cookie might be too robust to break on a six foot drop, depending on the angle of impact. If you decide to make your own, do the opposite of advice to prevent crumbly cookies: use a "softer" flour (cake flour rather than all-purpose, which has less protein), use too much flour, use not enough fat, overbake, and use a dark cookie sheet. These cookies aren't likely to taste quite as good, though, so if your secondary goal is a tasty treat it might not work out! For homemade cookies, my first choice would be snickerdoodles, and my second choice would be something very thin and crisp like Moravian wafers. The cakey texture of a proper snickerdoodle (made with cream of tartar) makes them prone to breakage, and the fragile, thin wafers break easily. As you guessed, most commercial packaged cookies are manufactured with being breakage-resistant in mind. The one exception I can think of is Nabisco Famous Wafers, which are quite fragile, and certainly won't survive an unprotected 6ft fall. If anything, you may find the wafers too breakable. A spritz cookie would probably work well for you. When made with a cookie press, the shapes have lines indented, which tend to break apart easily. 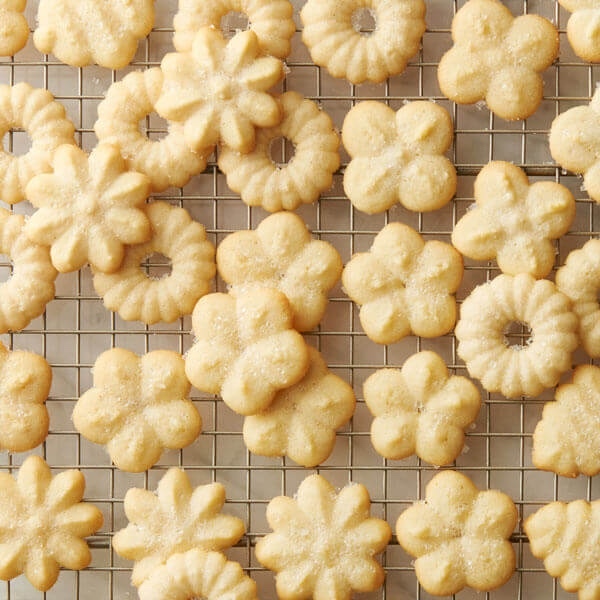 In principle, what should work best are shortbread cookies, that's cookies made out of pie dough. There is a reason that dough is known in German as Mürbeteig (brittle dough). This dough is made from just fat and flour, with very little water for binding, and it falls apart easily. I am not entirely sure how well it will work with storebought cookies. I have had brands which are bound much more strongly than homemade dough, and keep together more. So you will have to try your way through them, getting different brands, or really bite the bullet and bake. They are not a difficult cookie to make, although a beginner won't be as efficient as an experienced baker. Not the answer you're looking for? Browse other questions tagged cookies texture or ask your own question. What is this Italian Cookie called? Is it true that natural peanut butter splits in cookies? What kind of cookies can be shaped?